The Hindu god of auspiciousness, or success, Lord Ganesha is greatly revered in Thailand and is portrayed here with the head of an elephant, one tusk, two of his four hands, and his belt swaying as he dances. 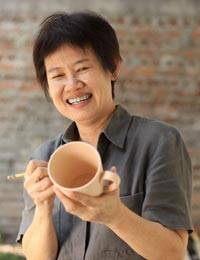 Duangkamol hand-paints his whimsical image in brown on this light blue mug, which she renders of Celadon ceramic. Ganesha's image is unglazed, while the rest of the mug features a crackle finish.